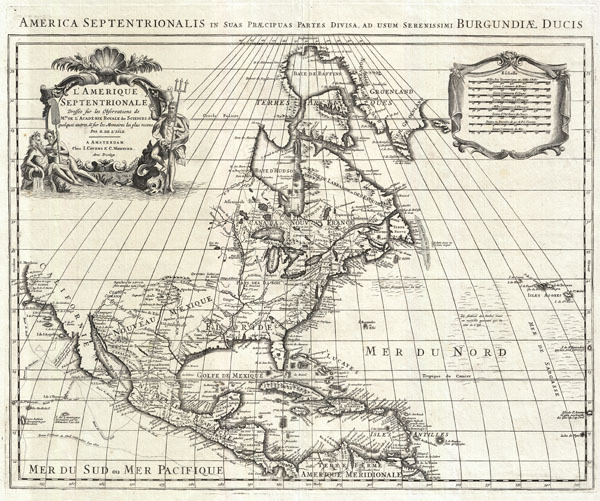 An influential map of North America considered, 'A Foundation Map.' Also, the first printed map to show the Sargasso Sea. L'Amerique Septentrionale Dressee sur les Observations de Mes. De L'Academie Royale des Sciences… America Septentrionalis in Suas Praecipuas Partes Divisa, ad usum Serenissumu Burgundiae Ducis. An extraordinary map, this is Covens and Mortier's 1708 reissue of De L'Isle's landmark 1700 mapping of North America. Covers the continent of North America from the Baffin Bay southwards as far as the Spanish Main, westwards to Cape Mendocino, and eastwards to include the Azores and the Sargasso Sea. Cartographically this map is practically identical to De L'Isle's map though the title cartouche has been moved to the upper left quadrant and the mile scales to the upper right with a new curtain motif frame. Tooley, in his Mapping of America considers this to be a foundational map and indeed it is one of the most influential maps to emerge from the De L'Isle workshop. Some consider this map to be one of the first to revert California to a peninsular state following the insular suppositions of the late 17th and early 18th centuries. However, this may be a misreading of the map. De L'Isle leaves the northern terminus of the Gulf of California open such that, though the form of California is suggestive of a peninsular state, should exploration prove the opposite, the cartographer was covered. On the west coast of California a false bay is notated though this may simply be a double mapping of the entrance to the Gulf of California. Further north along the coast San Diego, Seyo, Cape Mendocin, and Francis Drakes Port, and the English claim of New Albion are noted. Both Mexico and New Mexico are mapped with considerable sophistication with mines, indigenous peoples, mountains and river ways, and the missions of Santa Fe, Taos, and San Antonio de Senecu (El Paso) noted. The Mississippi valley is well developed and based upon the most advanced French information available at the time. The forts of St. Louis, Bon Secours are noted, as is the settlement of d'Iberville at Bilochy. Following the Mississippi north we fine the Great Lakes beautifully drawn on the Coronelli model. The French stronghold on the region is evident with forts at Tadousac, Quebec, Sorel, Montreal, and Frontenac identified. In an act of clear carto-advocacy De L'Isle confines the English colonies to the narrow strip of coastal lands east of the Alleghenies. The River and Fort of Kinibeki (Kennebec) is set as the northern border of English holdings in the region. Boston, Nantucket, Long Island, Manhattan, New Jersey, Pennsylvania, Jamestown, Roanoke, Charlestown, and St. Augustine, among others, are identified along the eastern seaboard. At sea there are a couple of elements of note. This is the first printed mapping of the Sargasso Sea, here identified as the 'Mer de Sargasse' where Icy flottent des herbes mais en montre quantite. Along the Mexican and California coastline the routes of various navigators including Olivier, Cortez, Gaetan, Mendonza, and Francis Drake are delineated. Just to the east of Barbados, in the Antilles, a curious apocryphal island appears with the label 'I. de Fonseca selon Quelquefuns.' This island, which is here surrounded by dangerous rocks and reefs, appears in several maps of the region as early as Hondius' Americae Novissima Descriptio where is as identified as Y. de S. B. This island was also identified by M. Rochette with the label Galissioniere's Rock. Other ships, including the Rainbow, claim to have seen the island as late as 1822. De L'Isle was the first to give the map a definite name, Fonseca. Even so, with so few sightings of the island it disappeared from most maps issued in the 18th century. There is some speculation that discolored water occasionally discharged by the nearby Orinoco River led to various false sightings of land. The condition of this map is of special note as it is nothing short of spectacular. The impression is so intense it is reminiscent of Coronelli's work and the overall state of preservation is remarkable. If you are considering adding an example of this map to your collection, this is the one you want. Mortier, P., Atlas Nouveau de diverse cartes choisies des Meilleurs Geographes comme Sanson, G. De L'Isle &c.. (Amsterdam) Chez Pierre P. Mortier, 1708. Very good, near pristine, example. Original centerfold. Tooley, R. V. The Mapping of America, p.19, #32 & 33; p. 18, #28. Philips (America) 580-56. Wheat, C., The Mapping of the Transmississippi West, 1540-1861, #79. Schomburgk, R. H., The history of Barbados: comprising a geographical and statistical …, p. 7.